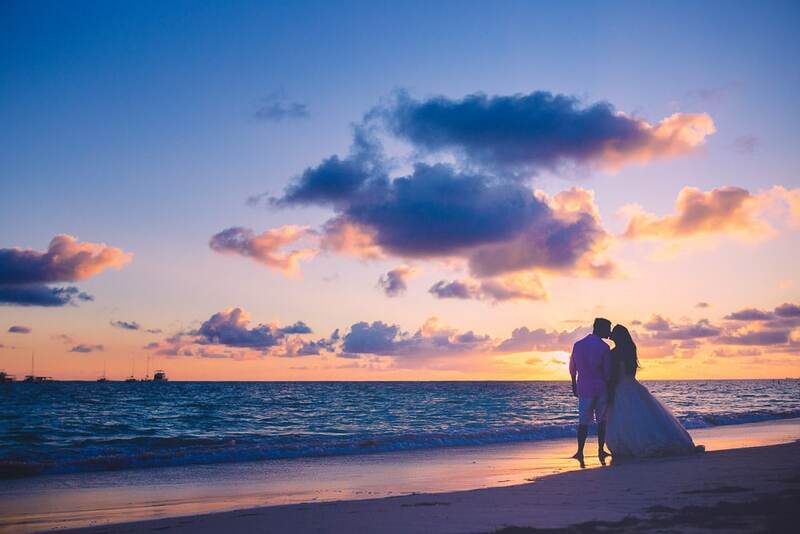 I would like to clarify some things about destination weddings in Punta Cana, for all the brides that are planning a special day. First and most important thing to keep in mind, is to understand that having a special day doesn’t always mean that it has to be perfect. What do I mean by that? Not starting the ceremony at the exact minute you planned it or not having everybody you want at the wedding can feel like a total failure, but it’s really not. Destination Weddings are not for everybody, same as travelling isn’t. Having a trip can be stressful itself, having a large group added to that trip just complicates it a bit. Imagine being a bride and you know things will get serious. That’s why is so important to understand that having a perfect day, can also mean things are going to fail. And if something can fail, it will… like our dearest friend Murphy already knows. But even if things go wrong, you can still enjoy and have a wonderful time. The bride and groom, as well as the guests, have a role in the wedding and everybody has to keep up to that role to help things running smoothly. Your guests can enjoy the day by being present, without having to be all over social media, or taking pictures with phones since there is already somebody taking care of that.. and most likely will do a much better job than the person holding the Ipad and blocking everybody’s view. I would like to emphasize and concentrate your attention on this subject. Have you ever heard about an Unplugged Ceremony? What is an Unplugged Ceremony? 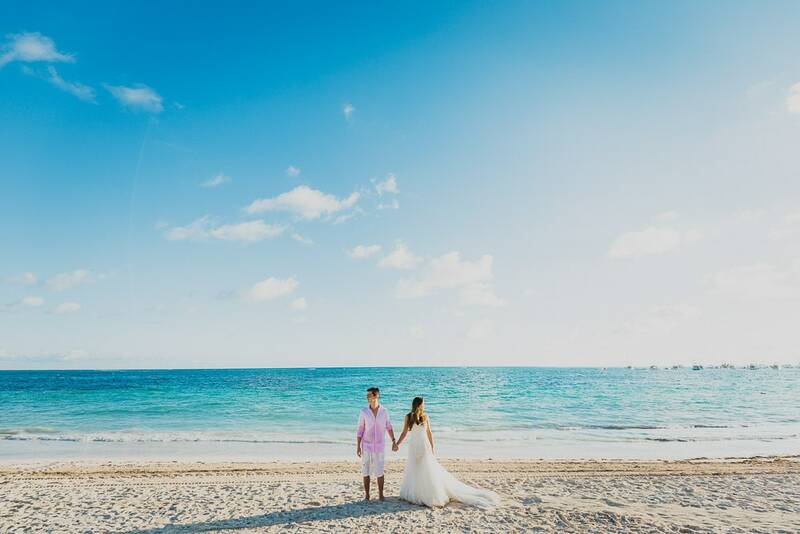 Basically, an Unplugged Wedding Ceremony will allow you to get married in Punta Cana, or anywhere in the world you choose, and fulfill with the deepest goal a bride can have. Have all the attention from the guests on you and your beloved one, and not on Facebook counting likes of the photos they recently uploaded. You are probably wondering now… how do I do this? Easy peasy. Have one of those lovely signs at the entrance of the ceremony, the ones you can easily buy on Etsy or Amazon (although we highly recommend you get it from Etsy), that will notify your family and friends that using phones or tablets is not allowed during the ceremony. An awesome photographer is already making sure the photos are going to be excellent, fascinating and emotional, and none of that can be possible with a tablet stuck on their face. Because things happen, and you came to a tropical country, you can encounter some rain before or after your ceremony, and it is essential you keep a positive attitude. You can get upset and think your day is ruined, or come out to the rain with an umbrella and smile for the photos. Happiness is a matter of perspective. In Punta Cana we are used to see some rain throughout the year, but some months are wetter than others. If you think that coming to get married in September will be the worst thing ever, all I have to say is: It’s all a matter of luck! In here it usually rains at night, and it’s sunny during the day! It’s not always the case, but you may be luckier than you think. Let’s talk about the people working to help you get the wedding of your dreams. They will be working on your wedding day, and the next day in somebody else’s wedding, and the day after that and so on. This people know what they are doing, trust me. I consider myself to be one of those crazy people that decide to be there everyday for others watching them making good decisions in pursuit of their happiness. Because we know what we are doing, it is important you trust us. Trust your wedding planner and in anybody that can make your life a little easier. Schedules are made to be followed, but this doesn’t mean you will have to be everywhere in that schedule. If your guests are having a cocktail hour, let them enjoy it. You can be enjoying your time with your new hubby while you take romantic pictures at sunset. That’s what moments are for, to enjoy them! One step at a time, let’s not get ahead of ourselves. Destination Weddings, as well as all the rest of weddings, are about details. This doesn’t mean you have to buy every possible accessory there is to fill out space, it’s more about the details involved in every little action that make moments, real moments. Instead of buying your groom a $500 watch, you can maybe sit and write a letter that will touch him deeply. This is the type of action that will make that moment when you first see each other, much more emotional. But when will you see each other for the first time? Well, that is up to you… or if you trust us, we can give you another option. Don’t get me wrong, this is only a recommendation, you will choose according to what you want to do, and not according to what your photographer says. But anyways, I would like to explain how a First Look works, and what it is exactly. You probably know ever since you were a little girl, that one of the most important moments in a wedding is when the brides walk down the aisle. Everybody stands up, tears everywhere, people get emotional and your groom’s legs will melt like an ice cream. If you choose to do so, these emotions can be spread out during the entire day, if you and your partner decide to see each other just a few minutes before the ceremony. The first look consists in meeting in a private place, in which the only people present will be your photographer, your groom and you. Right after the Getting Ready, all prepared and good to go. As a general rule, the groom is not allowed to see the bride until she reaches out to him from behind. The groom turns around, sees her, and there’s your intimate moment… which by the way, gets rid of a big part of the stress you both might be carrying and allows you to start the whole process much more relaxed by having a few minutes to enjoy each other’s company. Having done this lots of times, I can say it’s a fantastic experience for the couple, as it is fantastic for the pictures since the photographer becomes a spectator and can capture every detail of the moments happening without interrupting at all. But the best part is that the bride and groom can fell like themselves, express their mutual feelings which usually are tears of joy, without so many eyes of family and friends surrounding them. After this magical moment, the ceremony takes place (maybe Unplugged, maybe not) and the wedding begins. After this comes the fun! Group photos, family and couple’s session and lots and lots of moments to remember. Here comes the part when the wedding planner tells us we have 5 minutes to take portraits of 50 people, and we say yes, although they know as much as we do that this yes actually means no, and that we need more time, so you and groom will not be in the first part of their cocktail hour. This is important and is best that you and your new husband keep that in mind. If you choose the wedding time wisely, and I hope you do, you can count with the best light of the day to take lovely couple photos after the ceremony. 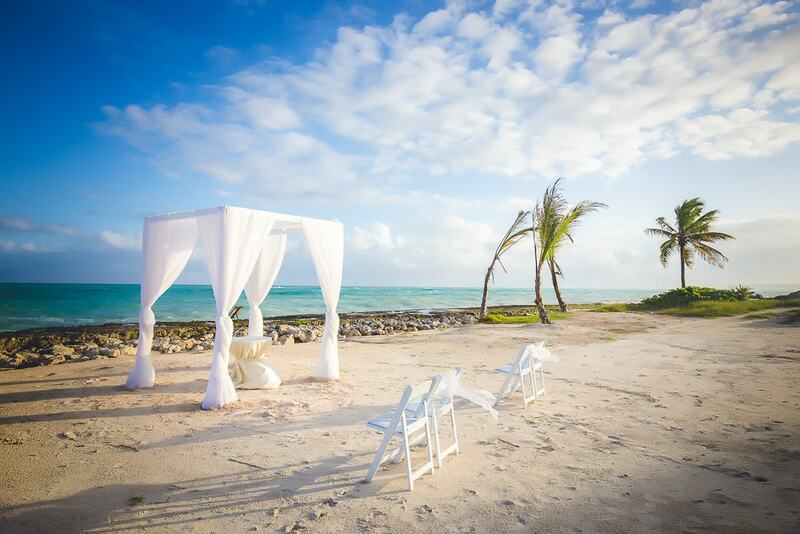 How to choose the time to get married in Punta Cana? Well.. this mainly depends on where your wedding is taking place since there are loads of hotels in the Bavaro / Punta Cana area. Just to give you an idea, there are more than 50.000 rooms available and thousands are added every year. As a general rule, getting married an hour and a half before the sunset is the ideal time to have soft natural light during the ceremony and the couple’s photoshoot. Some websites, like TimeandDate.com can provide information about sunrise and sunset times in Bavaro and Punta Cana. According to the time of year and month you are planning your wedding, we advise you to organize your schedules before hand, since some of the hotels can have more than one wedding per day, so getting the best spot at the best time can become an impossible mission. 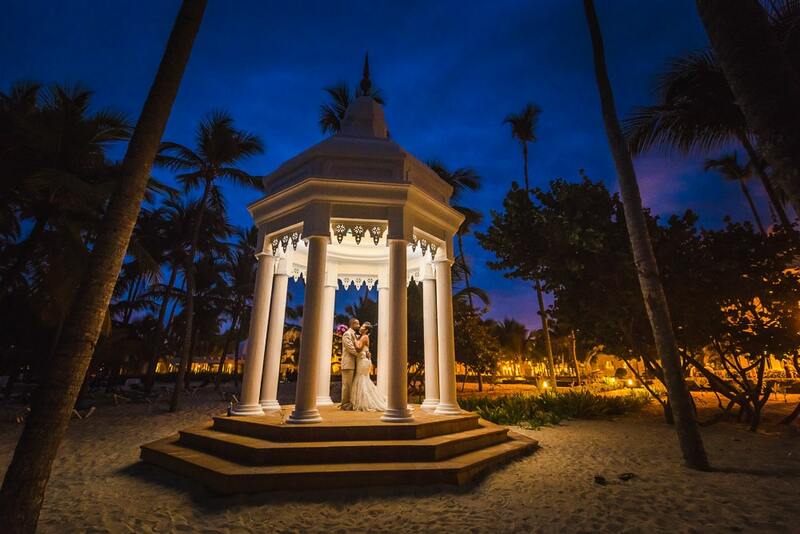 Saying I do in Punta Cana can be a wonderful thing if you choose the right place and make sure it’s up to your standards. 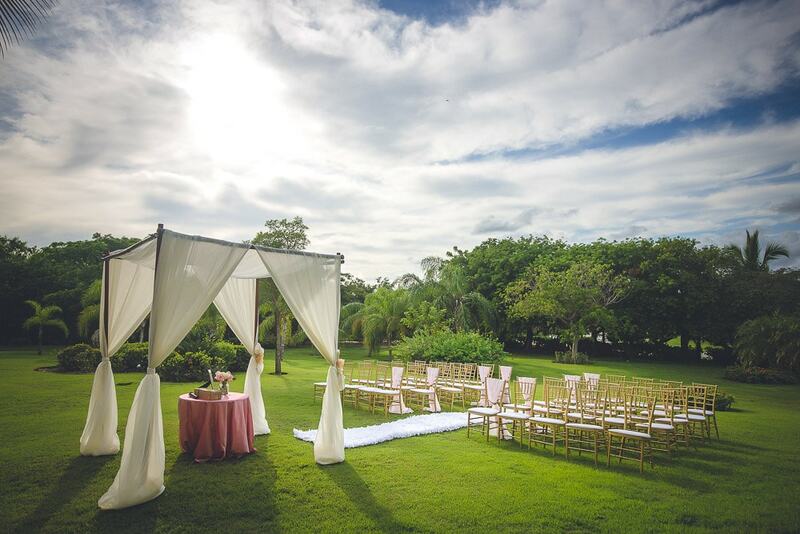 If it’s within your budget, we highly recommend having your wedding outside of your all inclusive resort. Outside venues like Kukua Beach Restaurant, Jellyfish Restaurant, Huracan Café, La Barcaza or Sanael Wedding Boat are some of them. If this is not an option for you because you would like things to be simpler, choosing a resort that has an average of 6 or 7 weddings a day may not be your dream place. You always need to check with the wedding department that you will have the availability of the place and time you chose. This is why it is necessary to keep a clear communication with your coordinator and explain your requirements. 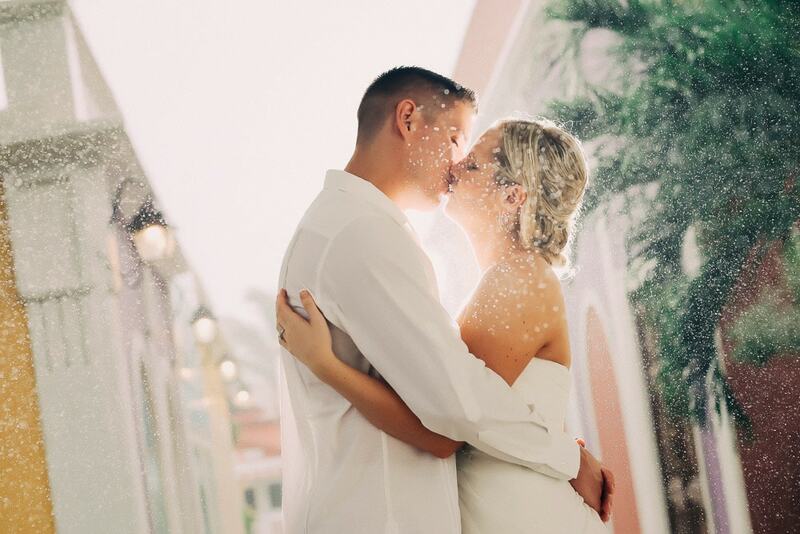 Some resorts from the area like Hard Rock or Majestic Hotels, have more than 500 weddings a year (if not more), imagine the availability at the time of making your reservation. If you were already done planning your wedding and you found out that the available times are from 11am to 3pm, you may not be so happy, since the photos you are used to watching are usually during the sunset times, or the so-called Golden Hour for it’s orange and golden tones. 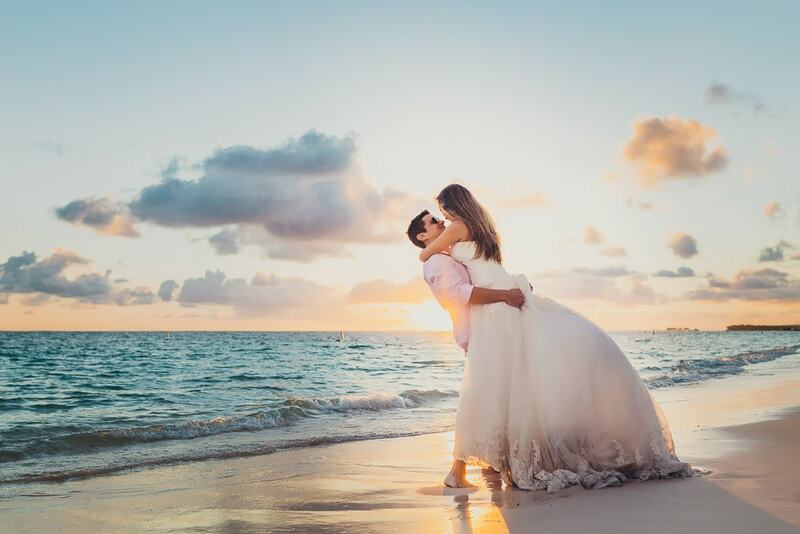 Other hotels, however, have different spots where simultaneous weddings can take place, and this will allow you to get married by the sea at the time you wished. Just a heads up, you might see one or two other brides walking around the hotel when you are headed to your ceremony. But don’t worry, not all hotels are wedding factories! A lot of them offer personalized service, but the way I see it none of them does it as good as the off-resort venues that we mentioned before. Since we are on the subject, we would like to mention that some hotels will charge you a fee to bring your own decoration (yes, what you just read), since you are not buying it from them. This kind of details are the ones you need to speak to your coordinator to prevent misunderstandings. Going back to other aspects of your wedding, there are some things you should know when it comes to the time of the photo session, and the most important one is, there is no such thing as people that look ugly in photos! There are people that feel uncomfortable in front of the camera, bad photographers and people that don’t really know how to capture other people’s best angles and expressions. It is fundamental, if not vital, that you and your partner can interact freely in front of the camera. Being able to keep a fun and natural communication will make your wedding photos as spontaneous as you are. Other hidden expenses hotels have are the Vendor Fees. These fees are charged to the couples if they want to bring an external vendor to the hotel, like a photographer, videographer or any other. Since their own vendors are not being hired, they charge a fee to get some profit. These fees can go anywhere from –not so bad- in hotel chains like Dreams to -nearly impossible to pay- where they can go up to 800 or 1000 dollars to bring an external photographer. If you are looking for a wedding photographer, you HAVE TO READ THIS. We won’t mention the name of these last ones because we don’t like to criticize any company or chain, but it is highly important that you talk to your wedding planner before booking your wedding in a hotel so you know exactly what you are getting into. If you choose to get married on an outside venue like Huracan or Kukua you will be avoiding this kind of fees completely. If you get married on a resort, you can always check their fees before making a reservation. Now that you have chosen a place to have your dream wedding, you are probably thinking about decoration and color palettes, but let’s talk about your dress. Like you and I know, there are dozens of kinds of different dresses, from ball gowns to sheath, to mermaid or short-styled. 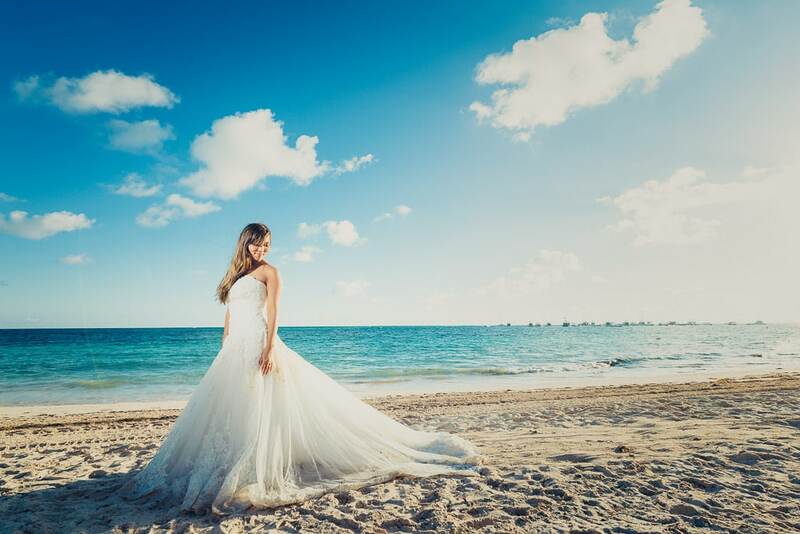 Many brides tend to forget they will be having a beach wedding and they go for an incredibly beautiful dress, but extremely thick for hot weather and hard to carry in the sand. It is of great significance that you choose a dress that you will feel comfortable in, walk freely and if possible, made of a material that doesn’t reflect light, to avoid the hints of blue from the sky, and go for a warmer tone of white. 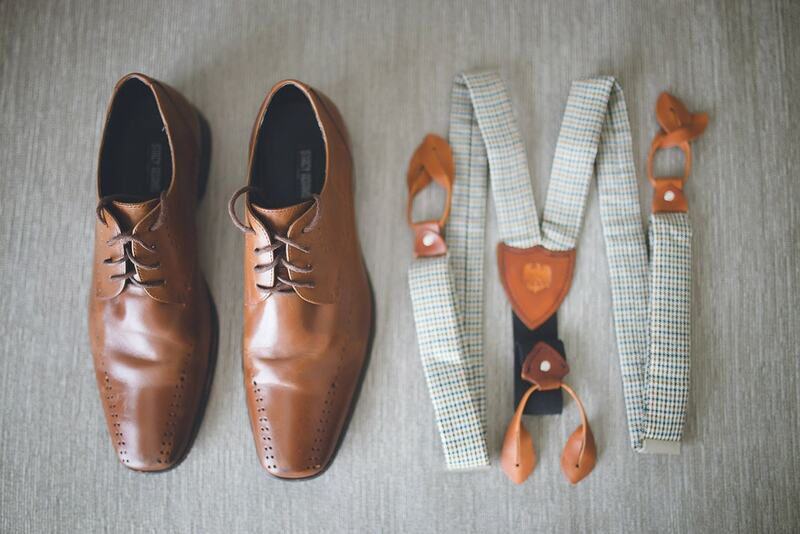 Together with the dress selection, comes the shoes. I’ve seen brides walking down the aisle with heels… in the sand. And this is not only dangerous to your own ankles, but you can actually trip and fall before you say I do! Let’s try to avoid that kind of show, and wear some nice barefoot sandals. You will thank me later. But you can still get those shoes you love! You can wear them in the reception which usually happens far from the sand in a nicely floored place. In terms of Bouquets, your coordinator will let you know, but if she doesn’t let me do it for her now. Caribbean weather is so so hot that flowers start to die before they even fulfilled their purpose, and it happens so fast you won’t believe it. If you go for a bouquet made of real flowers, which is the best option always, make sure you have the air conditioner on in your room or you keep them in the fridge before the wedding so they look as good as new until the time you need to use them. And they will look perfect. Now that you have chosen almost your entire outfit, it’s good to remind you of a few details that only a photographer can see to make your photos even greater than they will be. I have seen so many weddings where the bride has a stunning, detailed beautiful dress… and it’s on a plastic hanger. It’s so so hard to make justice to that dress! A simple wooden hanger or even a personalized one with your name on it will make your dress photos come to life. Within the range of accessories a bride can have, I would like to put some attention on the veils. It will not only be a great addition to your hairstyle, but it’s also versatile when it comes to photos. But let me be honest. Long veils and beaches don’t really get along… especially if the day it’s a bit windy, because your veil will be flying around and pulling your hair a bit. That’s why we recommend a shorter veil, birdcage style, or go for something completely different like a flower crown or a nice headpiece. If you are not sure of what accessories to use, think about what would make you feel comfortable on the beach. Everything you buy should be beach-friendly. Now let’s get back to our wedding timeline, when the ceremony, the pictures and the cocktail hour are over, comes the reception. Anything you add to the lighting will make your pictures a spectacle: It’s essential for your photographer that the reception has enough lighting so the background of the photos looks great. The professionals hired to work for your wedding will have their own lights, but it’s not the same to light a table with led lights, than with candles or hanging lanterns.. If you can get string lights even better! We love candles, and we are sure you love them too, but because we don’t want to see you frustrated on your wedding day, we want you to know something. Candles plus the wind from the sea equals zero candles on. No exceptions. The only solution is to use them with bubble bowls or windproof candle holders. Most of the resorts use flameless candles, just in case you want to check with your wedding planner. Since we have talked about the reception we would like to ask you to ask your parents and bridal party, that under no circumstances they write their speeches on a phone, or even worse, on a tablet. People don’t really know how hard it is to deal with unblocking a phone while reading until they go through it. The emotion fades and their faces look blue in the photographs. If we add a microphone to their other hand and a glass of champagne to toast, you will understand why we ask you this. Technology has many advantages, but when it comes to speeches, there’s nothing better than a piece of paper and a pen. There’s more to know about the reception. If you can afford them, there are a number of services that the guests and yourself will enjoy, especially if the group of people is not too big. Depending on the group that attends your wedding, if you have lots of young guests with a lot of alcohol running through their veins, they will be probably dancing all night. If the group is a more relaxed one, you might want to cheer them up with a “Fire Dancers” show or the “Hora Loca”. This last one will put every single last person on their feet to dance, no exceptions! Young, adult or elder will be dancing to the fun music and the animation group of the “Hora Loca” also known as the Crazy Hour. The Fire Show will not make everybody dance, but it will keep them entertained for 12 very intense minutes or so, in which all the lights go down and the only thing left is the fire and the dancers trained to do any type of acrobatics. 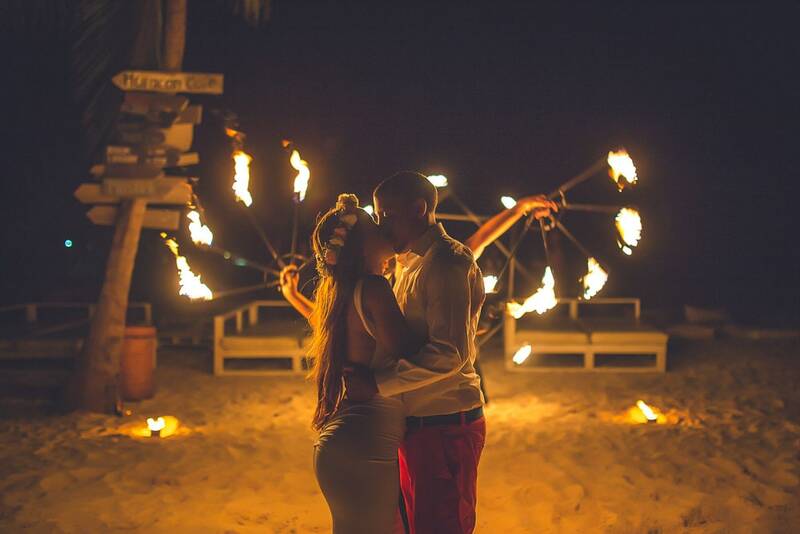 Some of the accessories that most brides would like to bring like the Chinese Lanterns are banned in Punta Cana, but you can always bring some less dangerous objects like Sparklers or Thank you and Just Married signs, that can add a fun touch to your memories. Fireworks are also an option for some resorts. They might not be the cheapest, but what better way to end a perfect and unforgettable night? At this point, the wedding ends, everybody is happy. For some people at least. There are others that decide to do one last amazing thing called Trash the Dress, and it is usually done the day after. And by this, we don’t mean tearing the dress apart like some people might think. It will get wet, it will be covered by sand, but no more than that… except at the end, you get the best pictures you can possibly imagine. Unforgettable, fun, and without a doubt a very particular memory that some people dare to try. When it comes to choosing a time for the trash the dress, it’s always best to do it at a different time than the wedding, so if your session was in the afternoon, you want to do the Trash session early in the morning, around 7 am or 7:30 am when the sunlight is soft and the beach is empty. If you are not willing to wake up that early, it probably means you had a great time the night before, and the photographer will work out another schedule that will get you amazing pictures after a nice cup of coffee, around 9 am or 10 am. 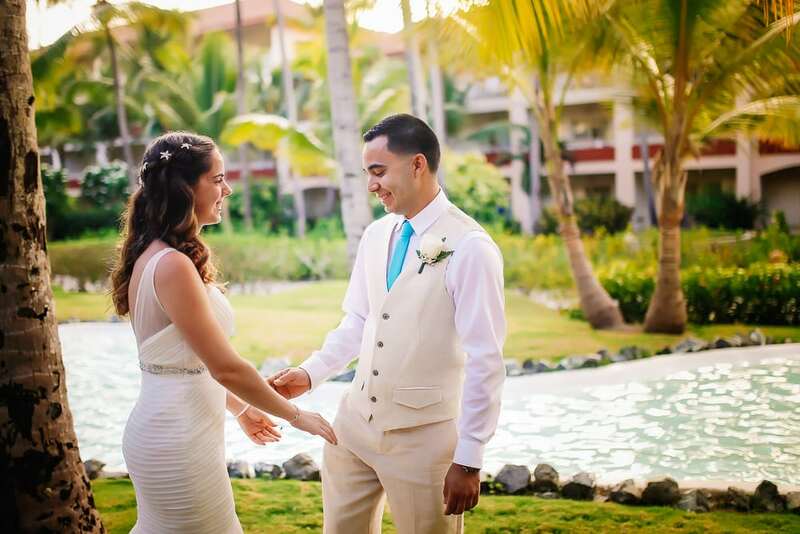 To finish this complete post about your wedding in Punta Cana, I would like to wish the best for you and your partner. No matter what your budget is, if you hire us or not, I recommend you to plan everything slowly, one step at a time. I would suggest that you include your special someone in the decisions so that you make that process together, and that on your wedding day, you relax and smile. That’s the only way to make your wedding day, a special day.